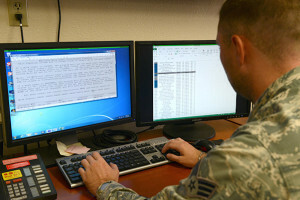 An Airman at Luke Air Force Base, Ariz., works on the Interim Work Information Management System, which was widely used by base civil engineers across the Air Force to track man hours, request parts and build maintenance schedules. The system is in the process of being replaced by NexGen IT. 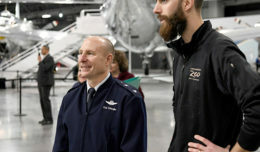 The new system rolled out at Joint Base Andrews, Md., in December 2015 and has been installed at a number of other bases since. The 412th Civil Engineer Group will transition to the new work management system called NexGen IT starting Feb. 4. Facility managers will not be able to use the system until mid-March. The downtime is required as a massive amount of data needs to be input into NexGen IT before 412th CEG and others can use the system. Base civil engineers realize this will be an inconvenience to Edwards customers, but it is required for better support in the end. The old systems, developed in the late 1970s and early 1980s, are slow, cumbersome and have become outdated. The outdated IWIMS system required paper submittals of work requests and required an extensive paper trail to manage. Both systems had limited Headquarters Air Force visibility and facility managers did not have access to the system to review facility work. 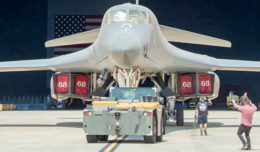 The new NexGen IT system is a web-based system that allows 24/7 access and has HAF visibility allowing a deeper dive into true infrastructure requirements across the Air Force Enterprise. In addition, NexGen IT has a robust preventative maintenance management system to enable on time preventative maintenance to extend the life of aging assets based on probability of failure and risk. NexGen IT allows 412th CEG to put resources in the right place at the right time and allows civil engineers to put the right emphasis on critical infrastructure first while still serving customers’ requirements. Under NexGen IT facility managers will have the ability to input service requests directly into the new system and track open service requests assigned to their facilities along with the ability to run facility reports. The 412th CEG’s priority system of assigning work has changed. The new prioritization system or work implementation model changes from a reactive system to more robust preventative maintenance work — basically fixing issues before they happen. * Priority 1 (Emergency work): The type of work that is needed to ensure/sustain continued mission operations. * Priority 2A (Preventative Maintenance: The right work/frequency to prolong asset life-cycle. * Priority 3A (Scheduled Sustainment work): High Mission/Equipment sustainment Risk, includes Safety RACs 1-3 or Fire Safety Deficiencies 1 or 2. * Priority 3B (Scheduled Sustainment Work): Moderate mission/equipment sustainment risk, RACs 4 or 5. * Priority 3C (Scheduled Sustainment Work): Low mission/equipment sustainment risk. * Priority 4A (Scheduled Enhancement Work): Work defined and work Prioritized by base/wing leadership. * Priority 4B (All Other Enhancement Work): Non-mission priority, potentially funded by other units. While transitioning to the new system, the Civil Engineer Requirements and Optimization office will only be accepting emergency work orders, all other requirements will be handled on a case-by-case basis. During the transition to the new system, CE response during February may be diminished so the group is asking for patience. The 412th CEG will still process emergencies, which will be done through paperwork then loaded into NexGen IT later. For questions, please contact your facility managers or CE’s Requirements and Optimization office at 661-277-3330.